ii) the Burton-style pale ale Louis Wehle, founder of post-Prohibition Genesee Brewery in Rochester, NY, introduced via Zett’s successor, Syracuse Brewery, Inc. (1935-1937 or 1938). As discussed in our last post, due to the timing of release of various beers all identified as of Burton or English character, we think it possible, even likely, that Wehle placed imported Burton fermenters and aging casks both in Rochester and Syracuse. In February 1935, Niagara Falls was supplied with Old Stratford Ale while Syracuse news reports I linked showed it was mid-1935 before Syracusans got a similar beer. Hence, possibly Wehle was running two Burton Unions to supply Rochester, Syracuse, and various points in the Niagara Frontier and upstate. We think the history might have gone, in 1934 based on advice from brewing scientist Francis Moritz in England he buys and installs a Union set in Rochester. And in 1935 he does the same for Syracuse but brings Arthur Vaughan, an English master brewer, to run them since Wehle was not on the scene to supervise, he was in Rochester at Genesee. In any case, and as confirmed in Wehle’s autobiography, he gave up on Burton Union production within a few years of launching the plan. 1938 seems the last year a beer of this type was marketed, Genesee Light Ale. Both Old Stratford Ale and Genesee Light Ale were advertised with varying amounts of detail on Burton Union production. Some ads even showed a line drawing of linked Burton Union casks with the distinctive trough running on top. What beer was sold in Syracuse though once Arthur Vaughan, brought from England in May 1935 to brew for Syracuse Brewery, Inc., had the Burton set running? This was Dickens Ale. 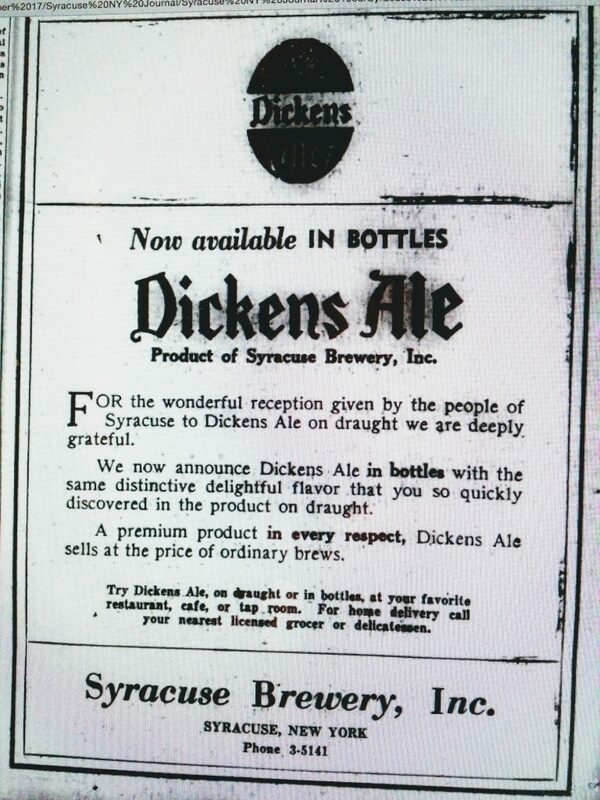 Ads for Dickens Ale, also sold outside Syracuse, did not trumpet Burton Union details. 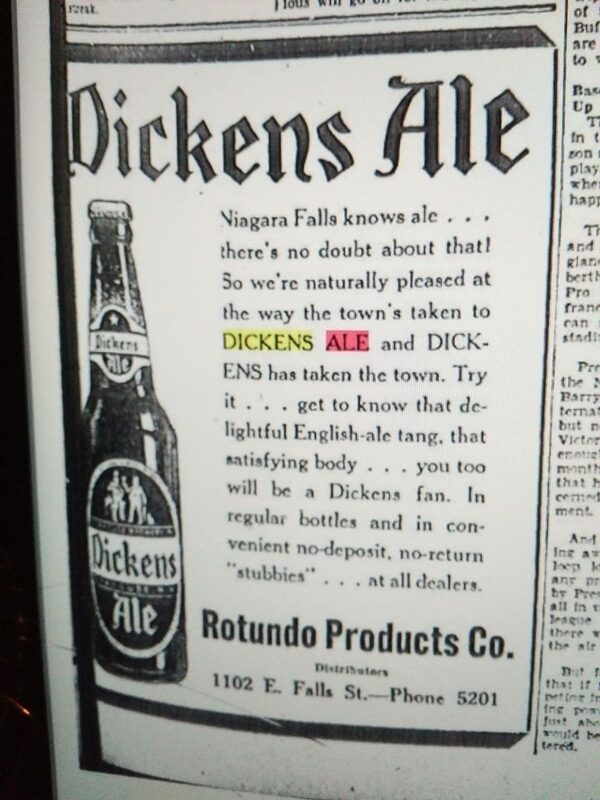 But Dickens Ale seems to have been the same beer as Old Stratford Ale and Genesee Light Ale, or essentially, i.e., just differently branded. Syracuse Brewery Inc. had emerged in 1935 from bankruptcy proceedings and was on a tight budget. It makes sense, therefore, that ads for Dickens Ale were less elaborate than Genesee could afford to run for Old Stratford Ale and later, Genesee Light Ale. Perhaps at some point Wehle stopped using all-English ingredients for Dickens Ale or even Genesee Light Ale but continued Burton fermentation and large cask dry-hopping and aging. The answer is somewhere deep in Genesee Brewery archives. The more traditional American ale in the Genesee line of the 1930s was 12 Horse Ale, sometimes described as a stock ale. It was probably quite fizzy and made mainly or only with American hops and malts. Not until the craft era inaugurated by Fritz Maytag and others in the 1970s did America get ales consciously made on traditional British lines again, with methods such as open-fermentation and both generous and dry-hopping. Of course the ales that emerged showed an evolution as they featured (initially) the distinctive American Cascade hop taste. Cascade was a new variety introduced in 1972. As to Burton fermenters, the craft producer Firestone Walker, founded 1996 in California, introduced a (rather modified, in our view) version. To my knowledge, the only two Burton sets used in production in the world today are Marston’s in Burton, and Firestone Walker’s. 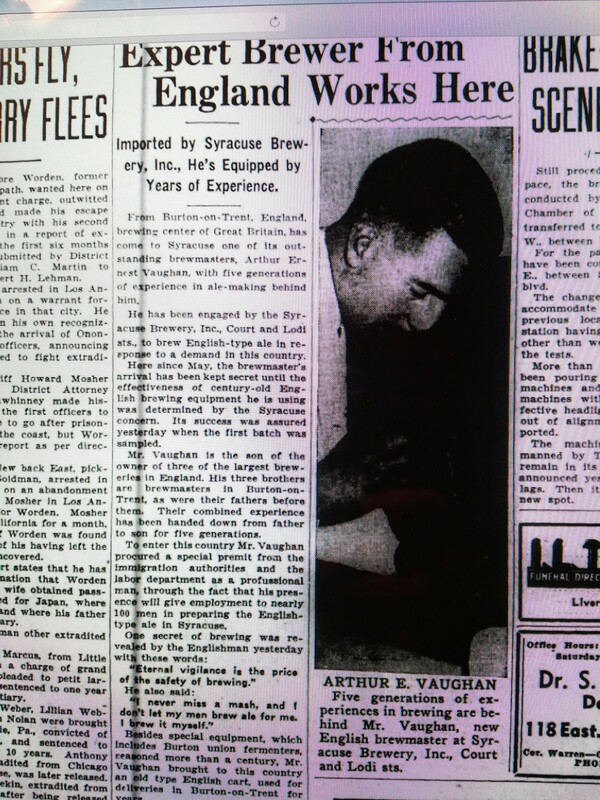 The above news story of 1935 in Syracuse, “Expert Brewer From England Works Here”, profiled Arthur Vaughan further. The detail offered is quite specific, yet some of it seems possibly exaggerated. We have had no success in tracing his line of brewers or the alleged ownership of famous breweries by his father. Coda. The 1935 story on Vaughan states that the fermenters, bought by Louis Wehle on his English trip that year, were “century old”. As I’ve mentioned and documented earlier Burton beer production was in serious decline by the 1930s. There was lots of excess kit, as the British say, in the sheds and yards of the sooty old town. Did a brewery or cooperage unload some wormy old stuff on a rich, star-struck American brewer? Was Wehle the Daisy Miller of brewing? I don’t think so. His record and success show the kind of person not easy to flim-flam. Anyway, it seems Wehle wanted old equipment because his book states – I included the extract yesterday – he wanted to capture the original Burton pale ale flavour he thought hidden in those boards. The fact that he wanted an English set, meaning it was made from English or other European oak, shows too he thought American oak wasn’t suitable for Union fermentation. Otherwise, why not build a Union from American oak in Rochester or Syracuse? Francis Moritz surely told him the wisdom then conventional and unchallenged in British brewing circles: don’t use American oak in any part of processing if you want English pale ale.